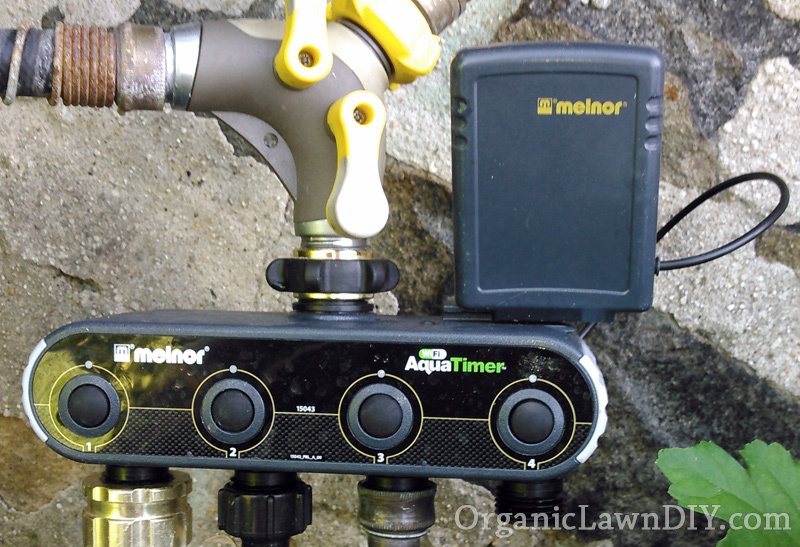 This year Melnor came out with a multi zone hose connected watering timer, the Melnor 15043-RSC WiFi AquaTimer, that connects to an outside faucet and can be controlled from any internet connected computer, tablet or phone. I was fortunate enough to get my hands on one to review and have been running it for a couple of months. I've been really pleased with the versatility, ease of use and the WiFi features came in handy many times. When weather conditions changed while I was away from home I was able to update my irrigation. There's even an option to install a wireless moisture sensor that can prevent over watering. I'm quite impressed with how well the WiFi AquaTimer works. The AquaTimer comes with a 4 zone valve unit that mounts outside onto a hose bib and a control unit that gets installed indoors. The control unit gets plugged into a wall with the included AC adapter and connects to your home's wireless network. The valve unit runs on 4 AA batteries and is weatherproof. 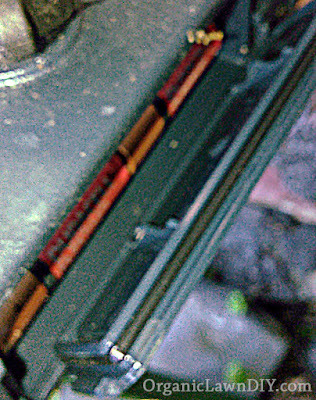 Melnor recommends using standard alkaline batteries and not rechargeables because the valve unit is designed to shut off when batteries are too low to prevent a valve staying open if the batteries die in the middle of a program. So far they haven't tested it with the many rechargeable batteries on the market. The battery compartment has an O-Ring around the cover to seal out water. The valve unit has 4 push buttons you can use to manually turn each valve on or off. Pressing one of the valve buttons will set the valve to run for 60 minutes unless there is some problem with the control unit connecting to the internet in which case the manual run time will only be 5 minutes as a safety precaution. This came up recently when there was a minor problem with the web service. All other control of the valve is done through the internet service at www.wifiaquatimer.com which you can access through your computer, tablet or smart phone. Each valve can be programmed independently to run up to 6 times a day. Each control unit can control up to two valve units and you can have up to two controllers installed giving you control of 4 valve units for a total of 16 zones. The basic way it works is you make changes to your programs through the website then the website will send the changes to the control unit. The control unit will send the updated program to the valve unit which then stores the program. If there is a problem with the control unit your network or the AquaTimer website the valve unit will still run on it's current schedule so your garden gets irrigated. You won't be able to make program changes though. More details on the WiFi AquaTimer follow but here's my quick take on it after using it for a couple of months. The AquaTimer has been very reliable with some impressive water saving features. Making changes to the irrigation schedules is very easy. I can make changes from a computer or phone anytime from anywhere I have internet access. This year I had to do some overseeding of the lawn in some areas and I've been using soaker hoses in parts of my vegetable garden underneath plastic mulch. The lawn seeding required frequent changes to the schedule as the seeds germinated and I didn't have to bend over and squint at a small screen to make changes every week. 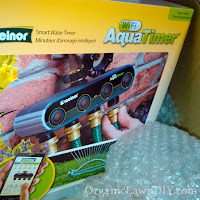 The soaker hoses were new to me and took some time to get the programming right but the AquaTimer made it easy and the optional AquaSentry kept me from over watering my plants if I screwed up. Setup was easy and the programming options are very versatile allowing up to 6 watering cycles per zone each day with the ability to water on odd or even days, every 1-7 days or selecting individual days of the week. The web interface is very nice, provides quick status and is easy to use. I wish they would have more logs, alerts and reports though. Some of which may be coming in the future. In addition to the scheduled watering programs you can also manually turn zones on from either the website or by pressing a button on the valve unit. A green LED indicates when the valve is open. The valves appear to be magnetic valves instead of ball valves based on the clicking sound I hear when a valve turns on or off. Battery life has been very good and a big part of the reason for that is because of the magnetic valves. I had an issue with one valve sticking at first but clicking it on and off a few times resolved it. With the optional Melnor 330 AquaSentry soil moisture sensor connected you can avoid over watering. Unlike simple rain sensors for other irrigation controllers the AquaSentry monitors the soil moisture directly to determine if there's enough water. This provides better control but you can only hook up one AquaSentry per valve. Since soil conditions and watering requirements can vary for each zone that basically means you can only have one zone with automatic rain delay. It would have been nice if you can have one AquaSentry per zone. Still it's a nice bonus and I use it for some of my heirloom tomatoes which are a bit more finicky when it comes to water. I've been monitoring the soil moisture with another soil moisture meter and the AquaSentry is delivering as advertised. I've been very happy using it but I wish that the male threaded hose connectors on the valve were metal instead of plastic. Since I imagine most people may be setting this up in the spring and storing it in the winter it would have been nice to include more durable hose connectors. In addition the control unit should have some option to mount it to a wall. It's light so using some 3M Command Strips would work but a more secure option to mount on a structured media panel would have been appreciated. Even through there are some things I wish were better the ability to control 4 zones remotely and how finely I can schedule irrigation times has been a great plus. If you don't want to install a full blown irrigation system but want something for spring or fall seeding or for your summer vegetable garden this is a great option. Overall I'm very pleased with the WiFi AquaTimer and it's available for a reasonable price on Amazon. MSRP is $199 but currently selling for $133 and available with Amazon Prime shipping. 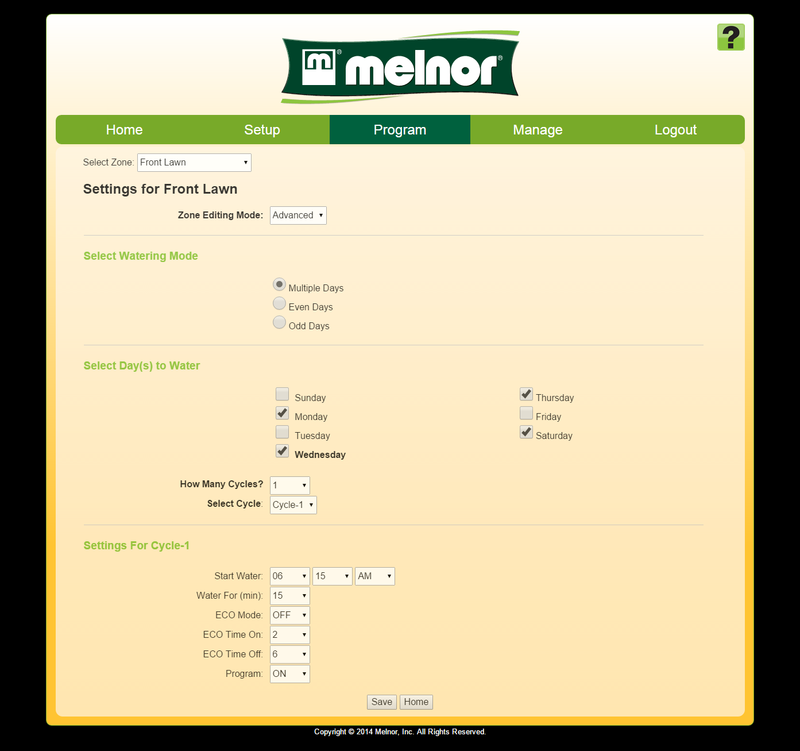 Setup is very straight forward and Melnor provides a very detailed step by step guide at www.wifiaquatimer.com/start. Simply install the 4 AA batteries in the valve unit and attach it to your outdoor faucet. It's a good idea, and code in most places, to install a backflow preventer device before the valve unit that will keep irrigation water from flowing back into your house water in the case of a pressure drop. I use a Homewerks VAC-BFP-Z4B Vacuum Breaker but check what your local codes require. My water pressure is very high and I also have a hose connected pressure regulator (Valterra (A01-1122VP) Lead-Free Water Regulator ) attached after the vacuum breaker before the valve body. It reduces the water pressure to 50-55 PSI which is around the optimum range for most sprinklers. The valve has 4 plastic male hose threaded fittings, one for each zone. Attach using standard garden hoses to your sprinklers. The control unit gets plugged into a wall socket indoors and needs to be able to access your WiFi network and be within a reasonable distance to access the valve unit wirelessly as well. Follow the setup instructions to connect your controller to your network. You'll need a smartphone or tablet to do so. A setup app is available for both Android and iPhone. The app is only used for setup and cannot control the timer. The instructions are easy to follow but I did run into an issue with the Android app. For some reason I didn't get a notification that my controller was successfully setup so I kept trying to reconfigure it until I checked my network status and saw it was connected. Keep that in mind. If you run into problems there is a reset button but no instructions on how to use it. I tried it out and it looks like you just press and hold it for a few seconds using the included push tool. I contacted Melnor about the reset button and they're adding it to their FAQ. 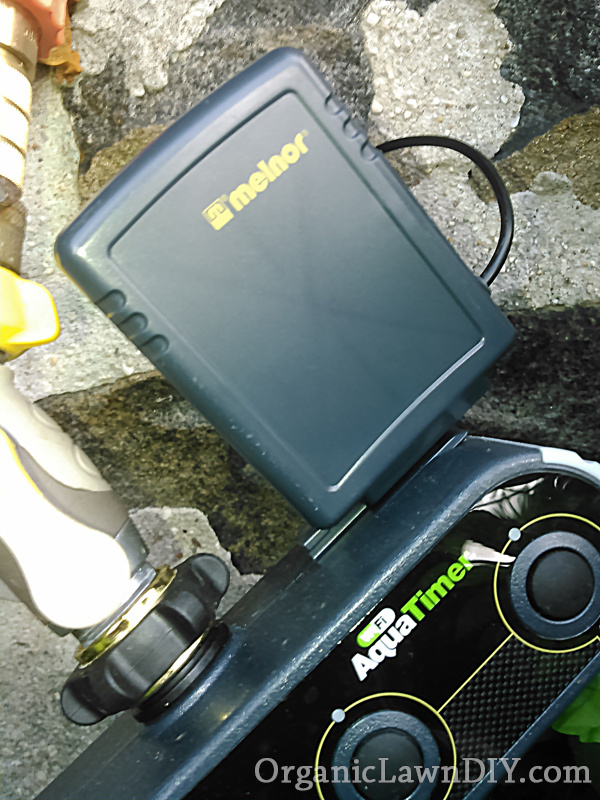 Once the controller is connected to the internet log in to the AquaTimer website to complete the setup. Create your account and enter your device serial numbers. You can also give your controllers, valves and zones names which makes it easier to identify them. Once all the hardware is connected everything else is controlled via the website. It would have been nice if there was an actual app that could send push notifications but the website is very easy to use from my phone and from my conversations with support, more features are planned. Once you log into the website you can quickly see the status of your AquaTimer irrigation system. On the top you'll even see your local weather forecast which can help you decide if you need to turn on a rain delay. The Valve is pictured on the screen and the status of each zone is displayed. If a zone is currently running it will show the amount of time remaining for the program. A picture of a drop of water under the zone outlet indicates the zone valve is open. This drop is an actual valve status indicator, it doesn't just display when the zone is on, it actually senses if the zone valve is open. At first I had an issue with one of the zones not turning on. The timer would start counting down but the drop didn't appear. After manually turning that valve on and off a couple of times using the button it fixed itself. For the past couple of months there have been no hiccups. In addition to the valve status, to the left of the valve picture you can see the battery level as well as whether an AquaSentry soil moisture probe is attached and communicating with the valve body. 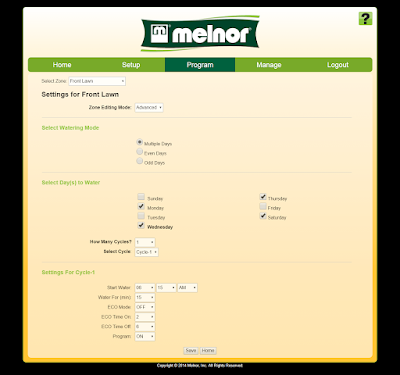 You can quickly turn the zone programs on or off, initiate timed watering manually, set rain delays or edit the programs from the website on either your computer, table or smartphone. Underneath the controls for each zone you'll also see when the next program will run. The WiFi AquaTimer and website are new for this year but I'm hoping in the future there are some more features in the website. I'd love to be able to see a quick overview of all the programming, upcoming schedules, watering reports including AquaSentry interruptions and get alerts when there are issues or conflicts. When you change a program and it overlaps with another program it will show a warning after you save the change but if you miss it you may run into problems. From emailing with Melnor Support it seems that some of the features may be on their road map but they couldn't give me any time line. I'd also love it if there was some sort of API so I could automate some schedule changes. For example when I put seed on the lawn I like to water multiple times a day but after germination I gradually reduce the watering frequency and increase the duration. Right now I have to manually log into the website to make changes. I've had a lot of questions about the website and AquaTimer and have to say that Melnor's support has been great! My questions always get responded to quickly and they have been able to answer even some of my tough technical questions. There was one display bug I noticed in the website related to the Simple program but that was fixed promptly. All programming is done through the Wifi AquaTimer website and is very flexible giving you complete control over how your landscape is watered. Each zone is programmed independently using either a simple or advanced programming interface. Both the Simple and Advanced Programming modes feature an ECO Mode option that can help prevent water runoff. The ECO mode allows you to water in intervals with the sprinkler shutting off to allow the water to soak into the soil before resuming watering. In the advanced programming mode you can fine tune how long the watering and waiting times are but in the simple program it is set to 2 minutes on and 6 minutes off. If your soil has a slow percolation rate and your sprinklers put out a high volume of water this is an important water saving feature that will allow you to provide the correct amount of water while delivering the water slowly so it can seep in. One thing to keep in mind though is that if you want to apply 30 minutes of water to a zone using the ECO Mode you may need to extend the cycle time. For example in the advanced mode if you want to water for 30 minutes with 5 minutes on and 5 minutes off you'll need to set the Watering time to 60 minutes so you get a total of 30 minutes of actual watering. For many, the simple programming mode will work well. There aren't many options to get confused by but you still have a lot of control. I use the Simple program for some tomatoes in my vegetable garden. It allows me to water every 4 days initially and then in the summer I changed it to water every 3 days. Simply set the time you'd like to begin watering, how many minutes the watering cycle should run for and how often you'd like to water. You can chose to water every 4, 6, 8 or 12 hours or every 1 to 7 days. In addition you can set the ECO Mode on which will cycle the sprinklers on for 2 minutes and off for 6 minutes during the watering cycle to prevent runoff. If you're using the ECO Mode option you'll need to multiply your watering time by 4 to get the desired amount of water. If you'd like to provide 20 minutes of water you'll need to set the watering time to 80 minutes. That way you'll get 20 minutes of watering and 60 minutes of waiting for the water to soak in. A couple of things to keep in mind. When you change the program it will reset. For example if you previously had the program set to water every 2 days and it's scheduled to water tomorrow but you change the program to water every 4 days, it's as if you reset the program and the next watering will be in 4 days, unless the watering time is later that current day in which case it will water that day. Additionally at midnight all cycles stop so check your schedules to make sure they have completed before then. As the seeds started to germinate I was able to easily cut back the watering from either my phone or computer without having to go out to the timer. The first step in programming in Advanced mode is to chose how days are selected. If you live in an area with water restrictions that only allow you to water on odd or even days you can select either of those options or you can choose Multiple days and choose which days you'd like to water by clicking the appropriate check boxes in the Select Day(s) to Water section. I like selecting the individual days because I can avoid watering when I usually mow my lawn. It's not a good idea to mow or even walk on your lawn when the soil is wet to avoid soil compaction or to water directly after mowing because it can increase the chances of disease. If you have a lawn service or other reasons to avoid watering on certain days of the week this comes in very handy. Next you select how many cycles you'd like to have on each watering day. You can have up to 6 watering cycles each day. Just keep in mind that each watering day will have the same cycles. You can't for example have one cycle on Monday and two on Thursday. To edit each individual cycle, first select it from the drop down list and make sure you see the words Settings for Cycle-x where x is the cycle you want to edit. Make changes to the program as far as what time you'd like to water, how long the cycle should run for and whether you want the ECO Mode to be on or off. In the advanced mode you can fine tune how long the on and off times will be for the ECO Mode. Remember that if you have your watering time set for 30 minutes with ECO mode on you will get less actual watering time. If you have 30 minute watering time with 2 minutes on and 1 minute off for example, you'll only get 20 minutes of actual watering so adjust your cycle times as necessary. 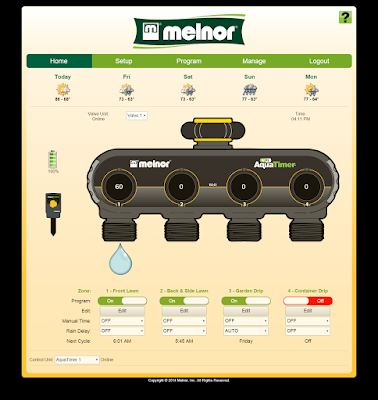 In addition to scheduled watering you can also start a manual watering time from the web interface. From the home page select the duration of the watering cycle (up to 60 minutes) from the drop down list in the Manual Time item for the zone you'd like to turn on. There's a short delay before the zone valve turns on and the zone starts watering. Once the time is up the zone will automatically shut off. Setting a manual watering time will bypass any rain delay. In addition to the ECO Mode option which can reduce water runoff there are two other features that can help you save water. A rain delay and a moisture sensor. If you know there's going to be rain scheduled in the future, or if you had a lot of rain recently, you can set the number of days to suspend the watering for each individual zone from the home page of the Wifi AquaTimer website. If you select 2 days, for the next 2 days no schedules will run for that zone. At the end of the two days the delay will turn off. There's no counter for the rain delay which would have been a nice feature so you know when your rain delay will end. The rain delay feature, and the ability to change it remotely, has been very useful. While my grass seed was still germinating I had set a rain delay before I headed out of town for a weekend but while I was away the weather forecast changed. Thanks to the WiFi AquaTimer I was able to turn off the rain delay remotely using my phone to prevent my grass seed from drying out. You may have noticed one of the options in the Rain Delay drop down list was Auto. Each Wifi AquaTimer Valve body allows you to connect a Melnor 330 AquaSentry. The AquaSentry monitors the moisture level in the soil. It consists of a moisture probe and a receiver that gets mounted and connected to the valve body. 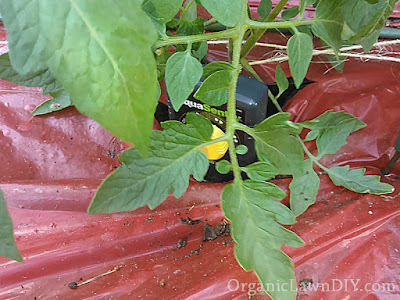 When the AquaSentry has detected that there is sufficient moisture in the soil, it wirelessly sends a signal to the receiver which tells the valve to shut down. Setup is very simple, just dig a small hole for the probe (don't try to push it in the soil it's plastic) then mount the receiver onto the valve and connect the wire to the back of the valve body. There's a knob on the front of the AquaSentry that controls how much water the soil should have. One drop indicates little water while three drops indicates the soil should be kept moist. Start with 2 drops and adjust as necessary. For the first time this year I have some tomatoes under plastic mulch using soaker hoses. This is new for me so I've been using the the AquaSentry on this zone to avoid over watering and so far it's been working great. I've tested it out a few times to make sure that the AquaSentry will indeed shut down the valve and it works. The only downside is you can only have one AquaSentry attached to each valve. If each zone has different watering needs that means you may only be able to use it for a single zone. That's the case for me. There is some limited possibility of using the info from the AquaSentry for multiple zones as a rain sensor but you'll need to make sure the zone with the AquaSentry in it runs last or you may under water the following zones. This isn't ideal but may give you some control but may over water some zones. Over the past few years I've been keeping an eye on Melnor's hose connected watering timers. They've been coming out with some very affordable options. They're new WiFi AquaTimer has been a complete joy to use at a very reasonable price considering all the features and WiFi support. Even some very expensive permanent sprinklers don't have WiFi capabilities yet. Melnor's support has been great. In the first year I expect some issues with the web service which they have been on top of. The hardware itself is fine. As the website adds more features the AquaTimer will get even better. It's easy to use and very reliable. It's a lot of fun too. The first week I was out every day checking my sprinklers or turning them on and off for no reason with my phone. :) 4 Zones is all I need right now but you can have up to 16 zones going with additional hardware if necessary. The Melnor WiFi AquaTimer is also available from Amazon with free Prime shipping which gives you plenty of time to get it and set it up before your fall lawn overseeding. Not being able to control and program the unit autonomously (without the web service) is a deal killer. Sorry. I was excited about using this for my high tunnel, but don't provide open access to my network to anyone. My Melnor wifi Aquatimer continues to go offline about 4 or 5 days! I unplug the control unit and plug it back in and I'm online again. The problem is when this happens when I'm on vacation and can't control my sprinklers. I wasted money on Grass Seed because it went offline and the seed wasn't waters for 1 week.